It’s befitting that on the eve of my family road trip I tell you about a road trip on TV. Project Runway fans, listen up. Lifetime has brought together a season one and a season two contestant, the very blonde Austin Scarlett and the very tall Santino Rice, to grab small town American women and get them gussied up for a big occasion. We saw a clip on The Fashion Team when they were on last week and it looks fun. Part of the challenge is they can only use what the little town can offer. So, in tiny town USA they probably don’t have a fabric store. What do they do? Did someone say pull down the curtains? That’s right, Austin doesn’t have the last name Scarlett for nothing. Their show debuts Thursday (tomorrow) July 29th at 10:30pm. Here they give the moms of the USA some advice through a virtual visit. Hats off –or pee cone, to Parenting.com for this HI-larious round up of useless or quite over priced parenting products. The baby heels I mentioned a long time ago,but how I missed the teddy bear made from a placenta…that’s right your very own. I just need a nightgown that lasts more than..hmm, 3 years. Moms put a lot of pressure on themselves to be perfect. Moms who feed their kids the right foods, get them to bed at the right time with few cartoons, that I do that, but you know? We are always keeping track of what we are doing good or not as good. I’ve joined the millions by seeing “Inception”. I enjoyed it and it is a brain teaser. Partly because of the plot and partly because of plot holes. My mom review would that at times it was hard for me to sit through since a main theme is DiCaprio’s character wants to get back to his children. A young girl and younger boy. Just like my set. It made me do a manicure in the theatre ( rip off the tops of my nails) and I very nearly ran out of the theater to go home an see them. Didn’t help that Vivien was so upset that we left her with a sitter, but jeez, I never see movies and it was just one afternoon. But, as the tension in the film goes on and on I could see her unhappy face standing on the front porch I wanted to escape the dream scape, toss the keys to Mark and Oliver and go running home. Or call a cab. When we did get home she was sitting and laughing with my mom. Glad I didn’t go chasing her down several levels ( that’s an in joke for people who have seen the film). The Shirley Sherrod debacle caused a lot of talking heads to say that this shows that “race is a big issue in America”, or “Obama bungled again” or “what kind of name is Vilsack anyway?” But, I think the big take away, the teachable moment is this: don’t trust bloggers. I say this as one. But c’mon, there is no journalistic ethics in the blog world. I don’t have an editor going over my copy or fact checking. The O in online stands for Opinion. That is what it is. Take it all with a more than a grain of salt. Trusting the veracity of an assertion from a non affliated blogger ( meaning, it’s not a Time reporter, extra) is like thinking some guy in Nigeria does have your lottery winnings. Omg, about to tape and realized I forgot to post this vid! Probably because at work I get to wear earrings without fear of them being ripped from my ear, necklaces without fear of being strangled and braclets that won’t be mistaken for toys. I also can wear big chunky cocktail rings that won’t scratch Rex. One day they will return…like my abs. NOTE: yes, Rex is very young here. Somehow this vid got lost. I’ve just started sleeping pretty well, so you know, stuff gets scattered. Like my brain. A few of us ponder what does it mean to have natural food? Lot’s of things are natural , bubonic plague, and we don’t covet it. Organic? Is that what we should look for. People all over ask what is meant by natural food? Karen from Chookooloonks asked Heather Spohr and myself if we get confused or is that something we care about. How about you? Alexandra was the first winner of the General Mills snack contest. 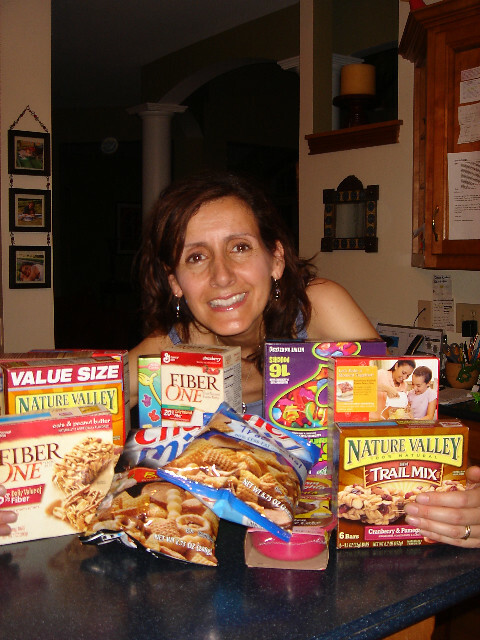 She sent me an email excited about the huge bounty of General Mills snacks she had received as her prize. You might recall her winning idea on creative snacks for kids was to put them in muffin tins. It worked for her 4 boys. She sent along this great picture of her embracing some of the snacks. With 4 boys I bet they get eaten. Congrats Alexandra! …or girls STILL just wanna have fun. Most women aspire to be partnered for life, but is that where the hi jinxs live? Even when you attain something you want – marriage, kids – the grass can occasionally seem greener. It’s like I was so broken hearted when we had to sell our home, but now that we rent and I see some maintnence issue I breathe a sigh of relief, “I don’t have to pay for it!” I’m not paying that property tax bill. Single moms can feel like they have stink on them and not be included in couple outings. I love single moms. My husband works so much at night that I rely on them to be the gals who can go out for dinner or come over with their kids and eat with us. They don’t have to check in with the ball and chain. But, sometimes these pals are occupied. They are occupied with their new, cute boyfriends. Last week Rex sat on Vivien’s old booster for the first time. Now, granted our sitter is crouched down next to him to insure he stayed there, but last night he sat unaided. We were invited over for dinner at our neighbor’s house (so nice). I brought over our kiddie table for Rex, Vivien and a 2 year old girl who was there. I made a plate for my kids and walked over to the adult table. Couldn’t believe it. He sat in the kiddie chair and ate his chicken. I am so used to feeling like someone from Quest for Fire. I was proud of him, yet there was a little pang, “He isn’t a baby anymore”. 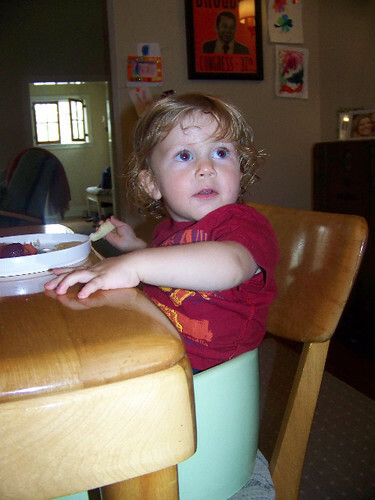 The mother of the two year old was fretting, “My daughter is running around, your kids are so good and they sit and eat their meal.” I assured her this was NOT the norm. But, it would be nice. Are you having another baby? I tried a month without camp, wait, a week without camp. Caught between the feelings of not wanting Vivien to be overscheduled during the summer, saving money and on the other hand needing her to be a tad more occupied. Especially with this heat wave, I’ve been getting cranky. “But, I asked you 3 times and I am hot and cranky! !” Slight whimper. So this week we are trying a different camp. One that is so cheap that if she doesn’t want to go one day I won’t –as we use to say in the 70’s–have a cow. Okay, here is a Cool Mom which I think plays more like a Momversation. Note: I’m also guilty of asking this question sometimes, but that doesn’t mean it’s right.